Commonly called the "meadow mushroom," Agaricus campestris is a European species characterized by a white cap, stocky stature, non-staining surfaces and flesh, pink-then-brown gills, habitat in grass, and microscopic features (including a lack of true cheilocystidia, and spores 6.5–8.5 µm long). 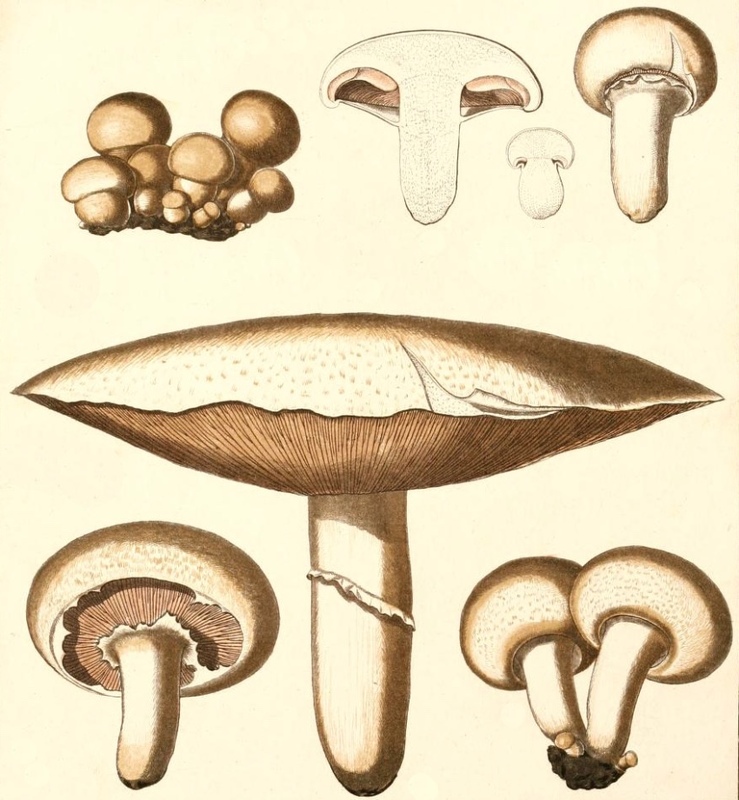 To the right is Bulliard's 18th century illustration of Agaricus campestris in France (1780). As a "field guide species," Agaricus campestris is well-known, widely distributed, and fairly common in North America. However, from a technical, scientific standpoint it is unclear whether (and where) Agaricus campestris actually occurs on our continent. East of the Rocky Mountains, according to Richard Kerrigan in his monumental treatment of Agaricus in North America (2016), "all similar collections . . . that have been sequenced distinctly belong to species other than A. campestris." In western North America, according to Kerrigan, "[c]ontinued use of the name A. campestris . . . seems appropriate, but must be understood to apply in the far west on a provisional or approximate basis until western material is better known." Unfortunately for those who do not have access to a microscope, examination of spores is the only way to approach accurate identifications within the North American campestris group, short of sequencing DNA. In the west, Agaricus porphyrocephalus var. pallidus has spores in the 6–6.5 µm range, length-wise, while Agaricus cf. campestris has longer spores (7–9 µm long). In eastern North America, campestris-like possibilities include Agaricus porphyrocephalus var. pallidus (most spores 6–6.5 µm long), Agaricus andrewii (6.5–8 µm), and Agaricus argenteus (8–8.5 µm). Ecology: Saprobic; growing alone, gregariously, or in arcs and fairy rings, in meadows, fields, lawns, and grassy areas; North American distribution uncertain, but at present not known from east of the Rocky Mountains. Cap: Medium sized; convex to broadly convex, occasionally nearly flat; whitish; bald and glossy to finely silky or a little scaly. Gills: Free from the stem; crowded; short-gills frequent; deep pink becoming brown and then dark chocolate brown in maturity; covered with a thin white partial veil when in the button stage. Stem: About as long as the cap is wide, or slightly longer; more or less equal above a tapering base; with a quickly collapsing white ring. Flesh: White throughout; not changing when sliced. Odor and Taste: Reminiscent of commercial "button mushrooms" and "portobellos" (Agaricus bisporus). Microscopic Features: Spores: 6.5–8.5 x 4–5µm; ellipsoid; smooth; thick-walled; brown in KOH. Basidia 4-sterigmate. Cheilocystidia absent. Pleurocystidia absent. Pileipellis a cutis. REFERENCES: Linnaeus, 1753. (Bulliard, 1780; Fries, 1821; Saccardo, 1887; Phillips, 1981; Breitenbach & Krënzlin, 1995; Nauta, 2001; Knudsen, Lange & Knutsson, 2008; Kerrigan, 2016.) I have not collected the European Agaricus campestris.